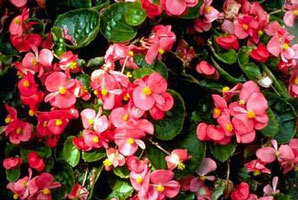 Begonias,are familiar tender bedding and house plants. Next to the geranium, begonias are probably the most popular for house culture of the entire plant list. The ease of culture, great variety of kinds, profusion of bloom or richness of foliage, together with their adaptability to shade, make them very desirable. _The fibrous-rooted kinds_ may be propagated by seed or cuttings, the latter being the usual method. Cuttings of half-ripened wood root easily, making a rapid growth, the plants flowering in a few months. _The rex type,_ having no branches, is propagated from the leaves. The large mature leaves are used. The leaf may be cut into sections, having at the base a union of two ribs. These pieces of leaves may be inserted in the sand as any other cutting. Or a whole leaf may be used, cutting through the ribs at intervals and laying the leaf flat on the propagating bench or other warm, moist place. In a short time young plants having roots of their own will form. These may be potted when large enough to handle, and will soon make good plants (Fig 125). Rex begonias usually grow little during winter, and they should therefore be kept fairly dry and no effort made to push them. Be sure that the pots are well drained, so that the soil does not become sour. New plants--those a year or so old--are usually most satisfactory. Keep them away from direct sunlight. An insidious disease of rex begonia leaves has recently made its appearance. The best treatment yet known is to propagate fresh plants, throwing away the old stock and the dirt in which it is grown. 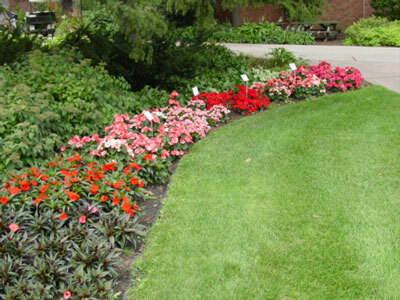 _The tuberous-rooted begonias_ make excellent bedding plants for those who learn their simple but imperative requirements. They are also good pot subjects for summer. If the house gardener desires to raise tuberous begonias from seed, he must be prepared to exercise much patience. 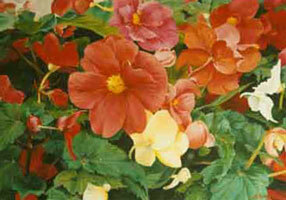 The seeds, like those of all begonias, are very small, and should be sown with great care. Start the seeds in late winter. Simply sprinkle them on the surface of the soil, which should be a mixture of leafmold and sand, with the addition of a small quantity of fibrous loam. Watering should be done by setting the pot or box in which the seeds are sown in water, allowing the moisture to ascend through the soil. When the soil has become completely saturated, set the box in a shady situation, covering it with glass or some other object until the tiny seedlings appear. Never allow the soil to become dry. The seedlings should be transplanted, as soon as they can be handled, into boxes or pots containing the same mixture of soil, setting each plant down to the seed-leaf. They will need three or four transplantings before they reach the blooming stage, and at each one after the first, the proportion of fibrous loam may be increased until the soil is composed of one-third each of loam, sand, and leafmold. The addition of a little well-rotted manure may be made at the last transplanting.